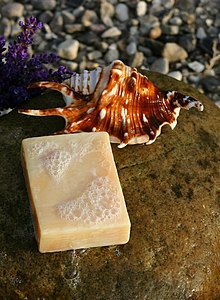 (uncountable) Soap is a solid or liquid that you use to wash things. The soap slipped out of her hand in the shower. We washed the dog with soap and water. The soap bubbles filled the sink. (transitive) If you soap something, you put soap on it. I soaped her hair while my daughter splashed in the bath. This page was last edited on 24 April 2017, at 06:15.